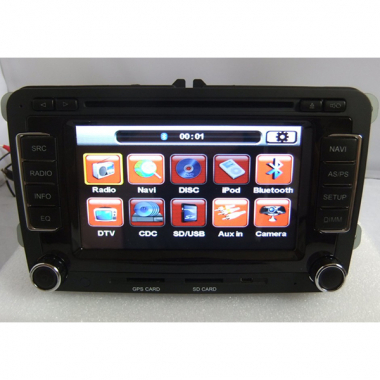 This 6.5 inch 2 DIN car dvd player is special for Volkswagen JETTA/ SAGITAR/ BORA MAGOTAN/ TOURAN/CADDY/ NEW BARO/GOLF V/GOLF 6/Passat B6, which has cool and unique Graphical User Interface design! It is built in Bluetooth for hand free call (the current mode will switch automatically to Bluetooth mode when call coming, the calling and music in mobile can be operated in devices after switch). Also it is built-in TV tuner and FM Radio. You can listen news anywhere and watch TV program anywhere. GPS Navigation function will your best helpful guider on trip. You can get the fast and accurate traffic line to the destination. Everythins is great, it's well worth the money to buy this vw dvd. Just installed this unit, it works well and the menu is beautiful much better than pictures. Gift box nice packing.